Stay on top of your subscriptions and engage with your customers, seamlessly. Don’t miss out on another subscription notification in Chargebee. Keep those alerts coming in through Slack. Chargebee’s integration with Slack can keep help you organize your subscription and payment alerts and subsequent follow-ups. Be notified. All the time. 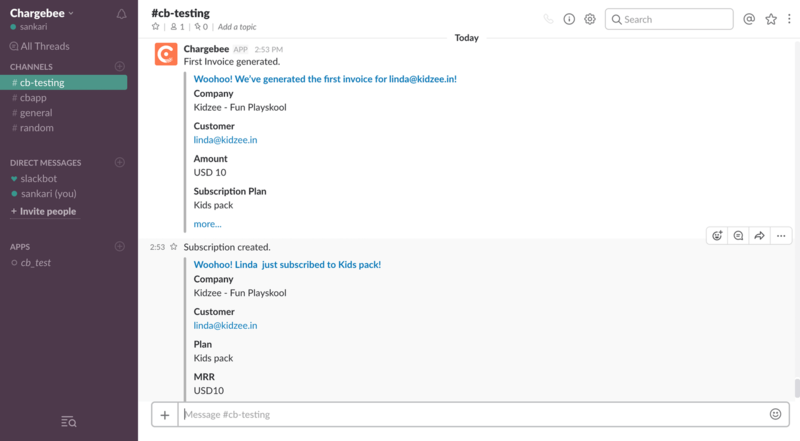 Notify your team about subscription and payments related events from Chargebee directly in Slack. And have relevant teams engage with your customers, within seconds. Track new subscriptions using this integration. Onboard customers and follow up on payments by selecting relevant notification preferences including when a subscription is creation or cancelled, when a payment succeeds or fails, and when the first invoice generated for customer. Payments failed? Invoice not generated? Subscription cancelled? Go from notification to solution within minutes. Stay on top of voluntary and involuntary churn, and accelerate growth, with prompt notifications and relevant action. It takes just two steps to connect your Chargebee account with Slack.